South Street Seaport is a former port area on the lower east side of New York which has been rejuvenated and revitalised in recent years. What was once a neglected docks is now a funky shopping area with restaurants, gift stores and designer shops. The centrepiece is Pier 17 which was converted into an indoor shopping complex and is packed with all kinds of retailers. Even if you don’t like shopping, it’s worth calling in to see the great views of Brooklyn and the BrooklynBridge. Since Pier 17 was converted, further areas around the pier have been modernised too to create a whole shopping and eating district. There’s also a marina here with sailing boats and you can still catch a boat at the Seaport, as it’s a stop for New York Water Taxis and also for sightseeing cruises. You can also now take a ferry from the Seaport to Brooklyn Bridge Park over the river. 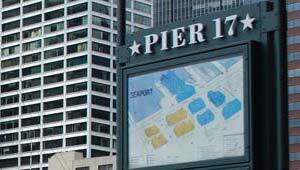 The area is home to the Seaport Music Festival and Pier 17 is a prominent location in the movie “I Am Legend”. The South StreetSeaport Museum is located here and it’s a regular stop for most of New York’s Hop-on, Hop-off Bus Tours. South Street Seaport is open Monday to Friday from 10am to 9pm and Saturday and Sunday from 10am to 7pm. Address: South Street Seaport, South Street & Fulton Street, Pier 17, New York, NY 10038, United States. South Street Seaport is located where Fulton Street meets the East River, adjacent to the financial district.